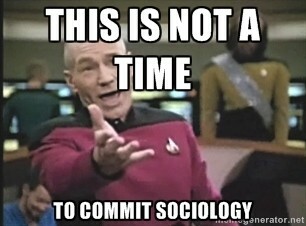 Thinking about how open access differs in sociology than in the other discipline that dominate this arena. I indicated in my earlier post that I would prefer to make data open to all, but the first issue (sometimes different from history, etc.) is confidentiality promised by institutional review boards on interview, survey, or observational data. It’s not insurmountable, just takes some thinking about how to protect those rights that don’t have be thought about in the same ways for traditional research or even posted on a closed system like Canvas. And, because I am a sociologist, I realize these questions of access are really questions about social class, education, and other demographic naughties that sociologists like to throw into the mix just to mess things up. What does “open” mean, exactly for those who have less access to the on line environment and little cultural capital to know what to do with it when they do get there? Even figuring how students deal with “information overload” or how they navigate through websites or determine which on-line information is worth using or not is highly classed, I think. An open system is pretty closed for those who don’t know what to do with it, and it actually might be even more insidious given its purported democratic nature. This entry was posted in Faculty Initiative on February 17, 2014 by admin. That’s a really great point, questioning what “open” actually means. In my last position at UCSF, I had several colleagues who worked for the Center for Tobacco Control Research & Education, helping process millions of pages of documents made publicly available as a result of litigation against the tobacco industry (see the Legacy Tobacco Documents Library). Tobacco companies were not happy to be releasing these documents, so they sent paper documents instead of digital ones, buried important documents within reams of relatively unimportant ones, and basically did anything they could to slow the process and/or make it harder for them to be organized, indexed, and displayed. It was pretty amazing, although not surprising I suppose. Your post also reminded me of part of the Edward Snowden investigation from last fall. The FBI required his email provider, Lavabit, to turn over their SSL key, which would allow them to decrypt and read Snowden’s email. After losing their appeal, Lavabit provided the government with the SSL key … as an 11-page document, printed on paper, in a 4-point font size. In order to actually USE the key, an FBI agent would have to enter the 11 pages worth of randomized characters by hand, and even a single error would cause the decryption to fail. So yes — there’s “open”, and then there’s open.